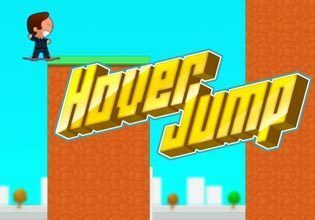 Get on your hover board and make your way through plenty of levels full of obstacles in Hover Jump, the latest arcade game from Softgames. You can control length and height of your jumps by clicking or tapping longer at the screen. Sometimes you have to risk a crash to be able to collect some of the coins that are scattered all over the level. Or you could decide to play it safe and make sure you reach the end of the level - it's your choice!Now jump on your board and play for free! This is the year 2015 and we have been promised hover boards, haven't we? While it seems we're in for a huge disappointment in reality the fantastic Hover Jump will surely make up for it.